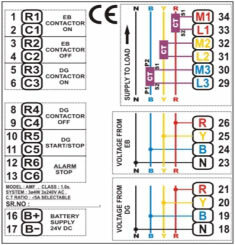 The AMF relay is a micro-controller based unit which automates generator start and stop actions during mains failure by controlling both mains and generator contactors. It also measures voltage, current and frequency and displays it on a 20 x 4 LCD. It has 12 LEDs for different indications. All programmable parameters are password protected and are stored in a non volatile memory and thus all information is retained in the event of complete loss of battery power. 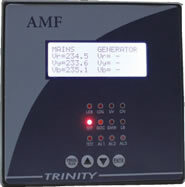 AMF can be operated in "AUTO","QAUTO" (Quick Auto) or "MANUAL" mode. The unit features a non-erasable incremental "DG run hour" and "maintenance hour. This unit is meant for use in three phase four wire systems. The "CT ratio" is site selectable. The unit is powered by a wide input (9-36VDC) power supply, which makes it suitable for both 12V and 24V battery systems. Displays voltage, frequency and current. Suitable for both 12V and 24V battery systems. Wide input (9-36VDC) DC-DC converter power supply.